People have asked me (actually one person in particular, i.e. my Italian-born father) why I don’t have more pasta recipes on my site or on my class menus. I know everyone loves pasta and it’s super easy to make, but I think the internet and cookbooks have more than enough pasta recipes to keep everyone busy. But more importantly, I think most people eat waaaaay too much pasta. And not just too many times in a week as my family was guilty of when I was a kid, but also too much in one sitting. I’m not a big fan of processed wheat flour which is nutritionally empty, loaded with hard-to-digest and inflammatory gluten, and causes a spike in blood sugar especially when eaten in large quantities. When blood sugar surges, the pancreas releases insulin, a fat-storage hormone which is also pro-inflammatory. If people could eat 1/2-1 cup of pasta in one sitting without any other concentrated carbohydrates at the same meal (that’s right, pasta plus garlic bread plus French fries is NOT a balanced dinner), and perhaps no other gluten-containing foods the rest of the day, I think we’d be in better shape, so to speak, than we are now. But it is really, really easy to overeat pasta. If you go to your neighborhood Italian restaurant, pasta is very often served as a main course, as opposed to in Italy where it is served in a much smaller portion as a first course. American restaurant portions can be upwards of 8-12 ounces per serving which is about 4-6 times the recommended serving size. Insanity. Believe me, I love pasta as much as the next person, but I don’t love its effect on my body. When I do eat pasta, I like to load it with vegetables and limit myself to a 1 cup serving. I also try to rotate different pastas in our meals, including ones made from brown rice, quinoa and spelt. But over the last few years, I have really enjoyed finding tasty and nutritious substitutes for pasta, such as spaghetti squash, millet-cauliflower mash, zucchini “noodles” and very often polenta. 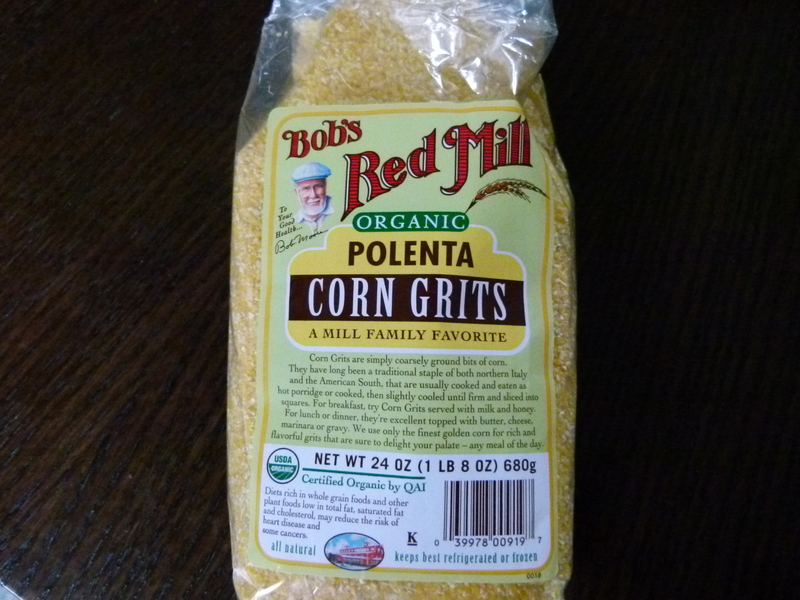 Polenta is kind of like grits, but from ground yellow corn. You can find fine, medium or coarse ground. It does have a little bit of a corn flavor if you make it with just water and salt. But add some grated Pecorino or Parmesan cheese and a bit of olive oil or butter and you’ve got yourself a bowl of spoon-lickin’ goodness. I really don’t know why more people don’t eat polenta. It’s super easy to make, incredibly affordable, gluten-free and pretty nutritious (try to get organic or non-GMO.) Most of all, it’s really creamy and luxurious-tasting. I prefer it thick and pourable, rather than firm and sliceable, but that’s fine too. I like to eat it with anything that I would serve on top of pasta such as meatballs, saucy vegetables, juicy greens, sautéed shrimp and so on. I usually make the coarse-ground kind because I like a little texture, but if I’m strapped for time I’ll throw some fine ground cornmeal into the pot and I’ll have it ready in 5 minutes and it’s very silky smooth. I think my girls like the “instant” polenta better because it’s creamier. They’ll eat it with anything I mentioned above. Mr. Picky has really only had a bite or two of polenta at a sitting and he thinks it’s “okay.” He always mentions he would prefer pasta. Thanks for the feedback, dude. What I will do for the little guy is make sure I cook something else that night that I know he will eat like meatballs or lemon-thyme chicken. Because if it were up to him, we’d be eating pasta every night. Insanity! In a medium, heavy-bottomed saucepan, bring the water to a boil. Add the salt. Then add the polenta to the pot slowly, whisking constantly. 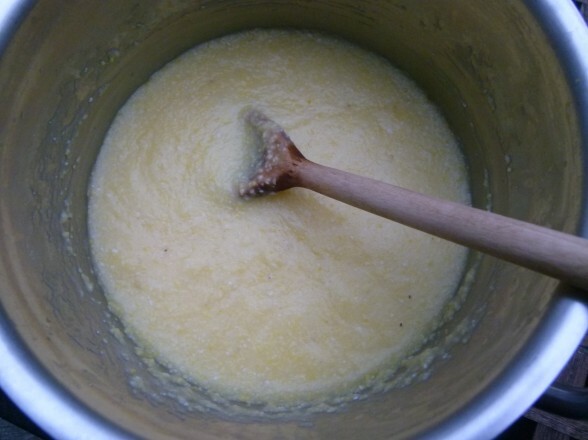 Reduce the heat to low and cook COVERED, stirring often, until the mixture thickens and the cornmeal is tender, about 20 minutes. 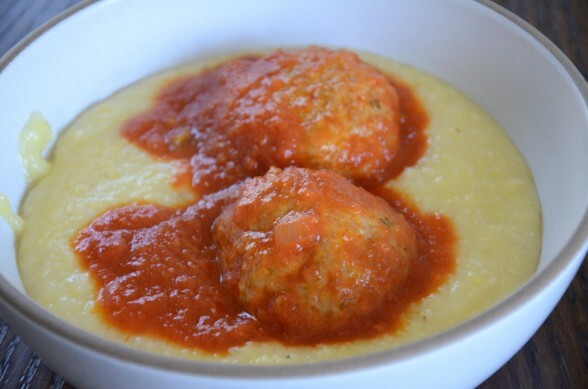 The polenta can be eaten now, but the flavors develop more and you’ll lose some of the grittiness if you can allow it to simmer another 20-30 minutes. Not essential, though. Stir in the butter and cheese and serve immediately or keep warm in a bowl set over a saucepan of simmering water. Polenta should be pourable and creamy. 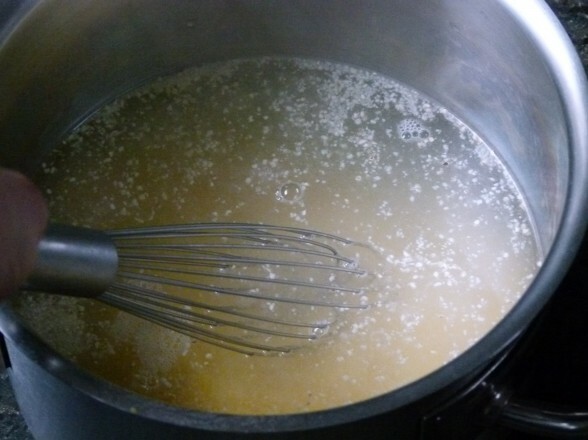 If it’s too thick, stir in more liquid. *You can also do a more “instant” version of this using instant polenta or fine ground cornmeal (like the kind you use for corn muffins.) That will take you 5 minutes. Other options: For extra richness, you can stir in an additional ½ cup of whole milk or plain, unsweetened hemp milk at the end, or some mascarpone or cream cheese; Mozzarella or fontina cheese. You can also add corn kernels, roasted garlic, or herbs, such as rosemary, basil or parsley. What is that yummy mushroom tomato mixture? Looks delish! It’s like chicken cacciatore without the chicken! 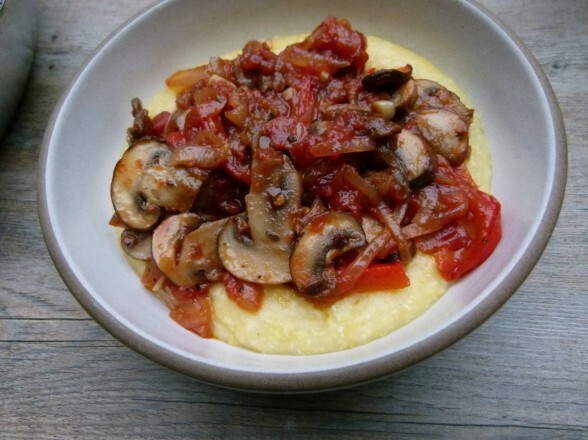 we serve polenta with chicken cacciatore or vegetable stew, yum! Yes! That’s what I made in the feature photo – it’s basically a chicken-less cacciatore.